Background: European forests are considered a crucial resource for supplying biomass to a growing bio-economy in Europe. This study aimed to assess the potential availability of forest biomass from European forests and its spatial distribution. We tried to answer the questions (i) how is the potential forest biomass availability spatially distributed across Europe and (ii) where are hotspots of potential forest biomass availability located? Methods: The spatial distribution of woody biomass potentials was assessed for 2020 for stem wood, residues (branches and harvest losses) and stumps for 39 European countries. Using the European Forest Information SCENario (EFISCEN) model and international forest statistics, we estimated the theoretical amount of biomass that could be available based on the current and future development of the forest age-structure, growing stock and increment and forest management regimes. We combined these estimates with a set of environmental (site productivity, soil and water protection and biodiversity protection) and technical (recovery rate, soil bearing capacity) constraints, which reduced the amount of woody biomass that could potentially be available. We mapped the potential biomass availability at the level of administrative units and at the 10 km × 10 km grid level to gain insight into the spatial distribution of the woody biomass potentials. Results: According to our results, the total availability of forest biomass ranges between 357 and 551 Tg dry matter per year. The largest potential supply of woody biomass per unit of land can be found in northern Europe (southern Finland and Sweden, Estonia and Latvia), central Europe (Austria, Czech Republic, and southern Germany), Slovenia, southwest France and Portugal. However, large parts of these potentials are already used to produce materials and energy. The distribution of biomass potentials that are currently unused only partially coincides with regions that currently have high levels of wood production. Conclusions: Our study shows how the forest biomass potentials are spatially distributed across the European continent, thereby providing insight into where policies could focus on an increase of the supply of woody biomass from forests. Future research on potential biomass availability from European forests should also consider to what extent forest owners would be willing to mobilise additional biomass from their forests and at what costs the estimated potentials could be mobilised. Data is also available on Zenodo. Compared with purpose-built units, excavator-based harvesters offer many advantages, but they also face one main limitation: a much higher fuel consumption, which also results in higher CO2 emission levels. The fuel efficiency of excavator-based harvesters can be increased by a better interface between the excavator and the harvester head. This study aimed to determine the performance of a new adaptation kit, specifically designed to improve the communication between these two components. The new kit offers real-time adjustment between the power demand of the harvester head and the power output of the excavator, which should help reducing fuel consumption while stabilizing hydraulic fluid temperature. The test was conducted on 53 excavator-based harvesters purchased and managed by a large Brazilian company. Time use, fuel consumption and production were monitored continuously for one full month, before and after installation of the kit. Overall, the study covered 40,000 h of work, during which the harvesters cut, processed, and debarked 4.5 million trees, or 650,000m3 of wood, under bark. Fuel consumption amounted to 900,000 liters. After installing the adaptation kit, productivity increased 6%, while fuel consumption per hour decreased 3.5%. Fuel consumption and CO2 emissions per product unit decreased 10%, as an average. The effect of random variability typical of an observational study prevented formulating an accurate figure for the amount of fuel that can be saved by installing the adaptation kit. Yet, one may confidently state that, in most cases, installing the kit results in a reduction of fuel use, and that such reduction is most often in the range from -10 to -20% on a per m3 basis. The objectives of this study were to examine the possibility of reducing the fuel consumption and CO2 emissions of harvesters during cut-to-length operations by applying various technical settings to the machine through the machine’s own software package. The adjustment of machine settings had an effect on the fuel consumption per unit product (l m−3) and can reduce the fuel consumption and CO2 emissions in cut-to-length harvesting operations. The main factor significantly affecting both fuel consumption and productivity was stem size. The study involved three cut-to-length machines operating in thinning with comparable stand environment and silvicultural prescriptions. The novelty of this work is in exploring the fuel saving potential of simple adjustments of machine settings in cut-to-length harvesting machines. Such adjustments have an impact on fuel efficiency and may reduce fuel consumption and CO2 emissions in cut-to-length harvesting operations. This work may result in a reduction of energy consumption and environmental pollution, thereby contributing to cleaner production. This study bridges the gaps between research, development and implementation: it offers practical solutions that may affect manufacturers as well as practitioners and entrepreneurs in the field. The outcome of this study may result in innovative technology development with less impact on the environment. 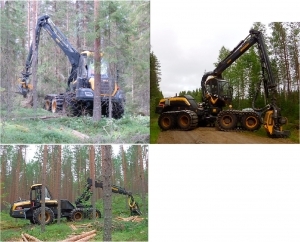 Figure 1: The machines studied in the experiment, upper-left the Ponsse Beaver, upper-right the Ponsse ScorpionKing, below the Ponsse Ergo. 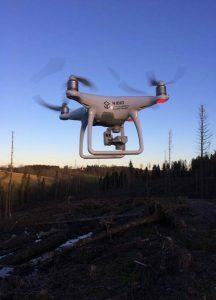 This paper provides an overview of recent developments in remote and proximal sensing technologies and their basic applicability to various aspects of forest operations. 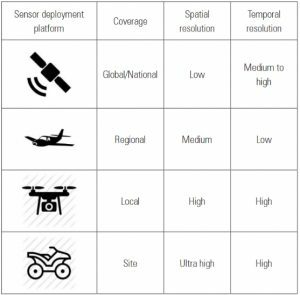 It categorises these applications according to the technologies used and considers their deployment platform in terms of their being space-, airborne or terrestrial. For each combination of technology and application, a brief review of the state-of-the-art has been described from the literature, ranging from the measurement of forests and single trees, the derivation of landscape scale terrain models down to micro-topographic soil disturbance modelling, through infrastructure planning, construction and maintenance, to forest accessibility with ground and cable based harvesting systems. The review then goes on to discuss how these technologies and applications contribute to reducing impacts on forest soils, cultural heritage sites and other areas of special value or interest, after which sensors and methods necessary in autonomous navigation and the use of computer vision on forest machines are discussed. 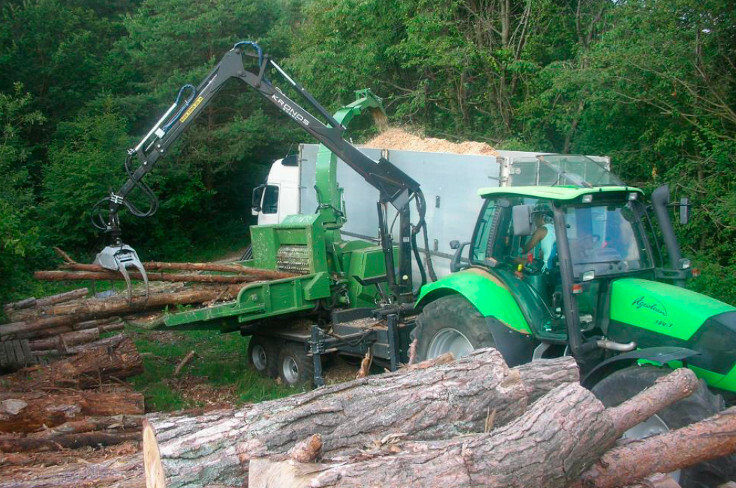 Acknowledging the absence of up-to-date empirical data on the value retention, service life and annual use of chipping machinery, in 2017 the authors surveyed the records kept by 50 contractors offering biomass chipping services. The machine fleet and operations in this survey could be taken as representative for most of Europe, where the biomass sector is well established and is facing further expansion. Data collection included the whole chipping unit, comprised of chipper, carrier and loader. Manually-fed units were excluded from the survey. The data pointed at a service life up to and exceeding 10,000 h and 10 years, which relieved any concerns about poor durability. Value retention was good, and may exceed that of other mainstream forestry equipment. Engine power was the main explanatory variable in any models to predict purchase price and productivity. The effect of this variable could explain most of the variability (>80%) in the purchase price and productivity data. Results also pointed at the essential equivalence in price and productivity between PTO-driven (i.e., tractor powered) and independent-engine chippers, once differences in engine power are accounted for. However, the distribution of purchase price between different components of the chipping unit was different between the two unit types, with the chipper accounting for a larger proportion of the total investment in independent-engine units. Machine power was also different, with most PTO-driven units being significantly smaller than independent-engine units, due to the limitations of existing tractors. Furthermore, half of the carriers assigned to a PTO-driven unit were subject to flexible use, i.e., they were not solely used for chipping work. New techniques have recently appeared that can extend the advantages of grapple yarding to fast-growing plantations. The most promising technique consists of an excavator-base un-guyed yarder equipped with new radio-controlled grapple carriages, fed by another excavator stationed on the cut-over. This system is very productive, avoids in-stand traffic, and removes operators from positions of high risk. This paper presents the results of a long-term study conducted on 12 different teams equipped with the new technology, operating in the fast-growing black wattle (Acacia mangium Willd) plantations of Sarawak, Malaysia. Data were collected continuously for almost 8 months and represented 555 shifts, or over 55,000 cycles—each recorded individually. Production, utilization, and machine availability were estimated, respectively at: 63 m3 per productive machine hour (excluding all delays), 63% and 93%. Regression analysis of experimental data yielded a strong productivity forecast model that was highly significant, accounted for 50% of the total variability in the dataset and was validated with a non-significant error estimated at less than 1%. The figures reported in this study are especially robust, because they were obtained from a long-term study that covered multiple teams and accumulated an exceptionally large number of observations.